Ok so i made my pixel art in a canvas 50*50, and i saved it. After that i wanted to post it to DeviantArt, but it was too small of course becouse it was 50*50 pixels, my concern is do i really need to set my canvas to 1024*768 resolution to make it big enough, or i can make 50*50 just biggger. Please somebody HELP MEE. 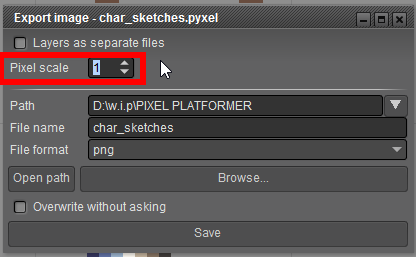 In the export window there's an option to upscale your sprite called "Pixel scale", increase that to say, 3 and export it again. There's no need to work in 1024x768 resolution. Ok but i dont see any export window i ony see export image and tileset but that just saves it. And i cant find "Pixel scale".